McDonald’s has ramped up the menu once more and is now selling its own Wagyu beef burger – and it looks absolutely delicious. Wagyu is known for being one of the best cuts of beef in the world and you never see it on the menu in fast food places. As always, it’s not available in the UK, but it is available across the fast food chain’s Australian branches – so if that’s where you are right now, or perhaps headed on a gap year, or even a holiday down under, you’re in luck. It comes with crispy bacon, caramelised onions and a tangy signature sauce. McDonald’s asks: ‘Why wouldn’t you Wagyu?’ And why the hell wouldn’t you? The verdict has been somewhat mixed, with plenty of people welcoming the limited edition addition to the menu, others weren’t keen. A confession, I tried the McDonalds Wagyu burger. My verdict… Beef like the filling of a padded envelope, bacon like broken glass, and suspect the sauce is just Big Mac sauce left out in the sun for a week. The burger is available at restaurants across the country who have launched the new burger retailing at $10.75 AUD. Robert Sexton, Director of Supply Chain at McDonald’s Australia, sent a statement to News.com.au saying the burger ‘continues to show their support of the country’s agriculture industry’. The launch of this burger is further testament to our commitment to use local suppliers wherever possible. We estimate that while this burger is on our menu, we’ll purchase more than 280 metric tonnes of Wagyu beef from Queensland. And McDonald’s Australia really are laughing in our faces with their breakfast offering as well. They have the ‘Big Brekkie Burger’ on their menu and it looks incredible. It starts with a warm, crisp hash brown sandwiched between melting cheese, rasher bacon and a freshly cracked egg. Finished with a 100 per cent Aussie beef patty and a generous dollop of BBQ sauce in between a toasted sesame seed bun. McDonald’s are absolutely on fire at the moment the big brekkie burger looks unbelievable. One UK customer expressed some form of anger and called for the branches here to ‘sort it out’. 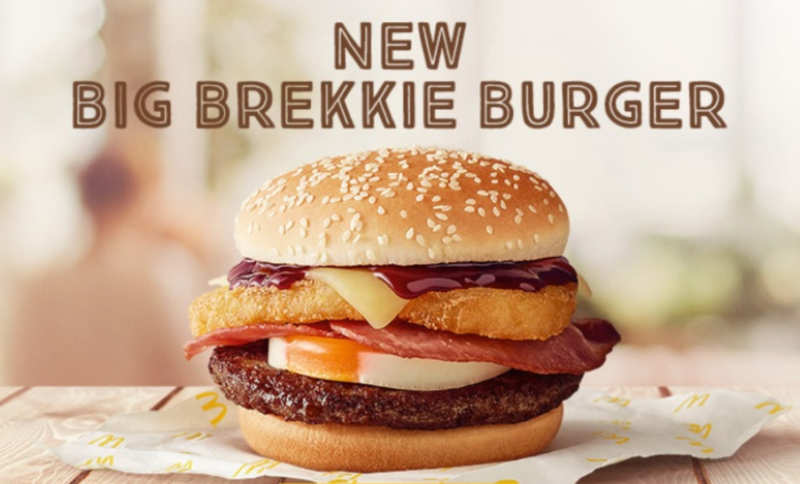 @McDonaldsUK @McDonalds why are the UK restaurants always behind other nations in terms of offering more food options, example Aussie Macca’s has just released a new brekkie burger and serves breakfast favourites all day. #SortItOut #updateyourmenu! Fear not, we have the Cadbury Creme Egg McFlurry available on the McDonald’s UK menu – and what more could you really want? Ice cream, blended with the yolky part of a Creme Egg and Cadbury chocolate sprinkled on top. What a great Easter treat for all.